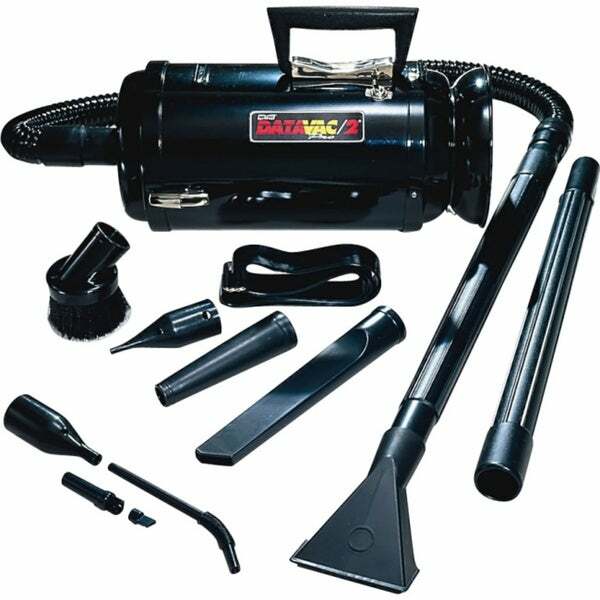 The Metro DataVac/3 Pro MDV-3BA 2-speed Portable Vacuum Cleaner includes a 1.7 PHP 2-speed deluxe power unit for strong and efficient cleaning. Includes cord storage halo, 3-foot flexible hose, 2 to 20-foot extension wands, 'Pik All' nozzle, Powerizer Air Maximizer, crevice tool, dusting brush, Air Pin Pointer, shoulder strap, three disposable bags, plus a 4-piece micro cleaning tool kit. For maximum maintenance and heavy-duty cleaning flick the switch to high and get the full use of DataVac/3's 1.7 PHP motor. Toner pick-up capability and 50-percent more power than the MDV-2BA. Includes all MDV-2BA features and accessories.